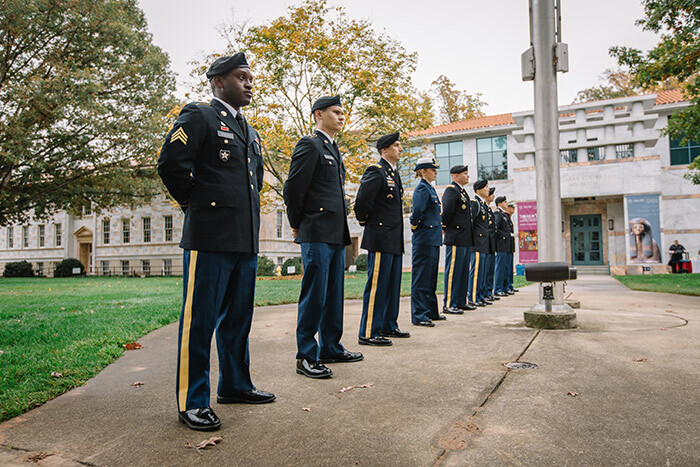 Emory held its ninth annual Veterans Day ceremony on Wednesday, Nov. 8, on the Quadrangle. The ceremony began with an honor guard of Emory veterans and ROTC cadets. Jeff Rosensweig, Goizueta Business School associate professor of finance and founding faculty sponsor for the Emory Veterans Association, welcomed attendees. 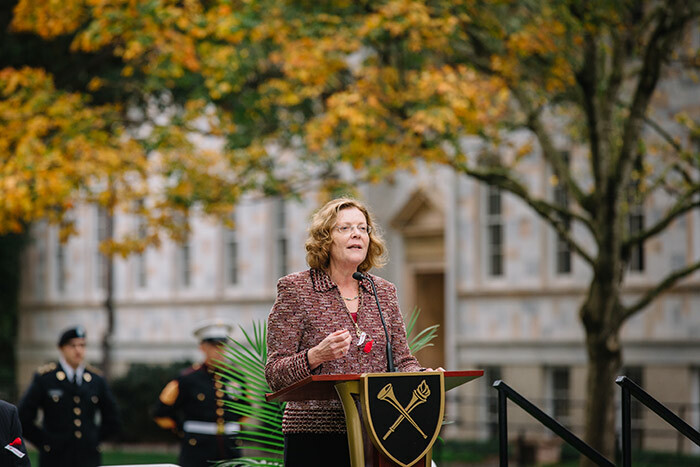 Emory President Claire E. Sterk thanked veterans for their service and outlined Emory's programs to support those who served in the military. Despite gray skies, the event drew a crowd of Emory staff, faculty, students and alumni. Among those recognized during the ceremony was retired Lt. Gen. Ken Keen (center), who served in the Army for 38 years and is now associate dean for leadership development in Goizueta Business School. "For those of us who are civilians, it is not always easy to understand what it means to have taken the journey that all of you have taken," Sterk told the veterans in the audience. 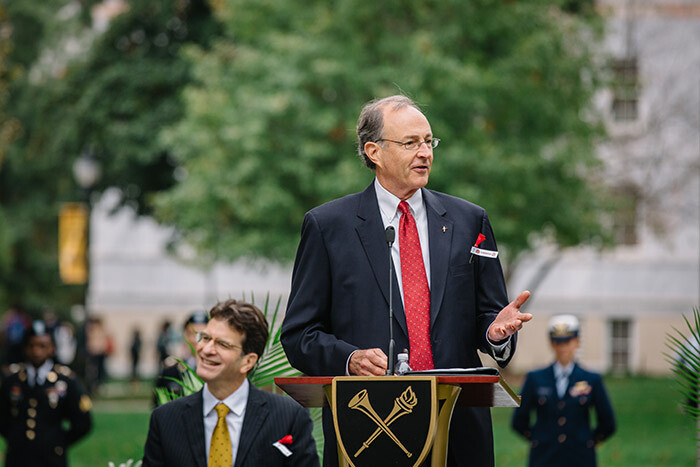 Sterk praised veterans as "our role models for the next generation of leaders." 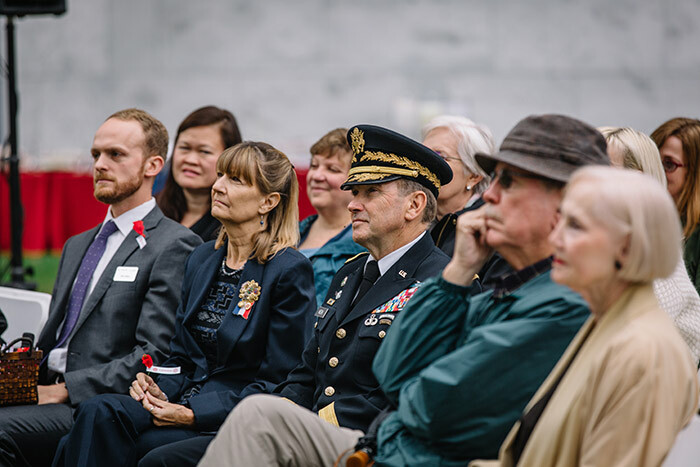 Michael Heekin, who served as a captain in the U.S. Army and as former chief operations officer of WedMD, was the ceremony's second featured speaker. Even as veterans transition to civilian life, Heekin urged them to continue their "commitment and readiness to defend our freedoms." The honor guard posed for pictures at the conclusion of the ceremony. 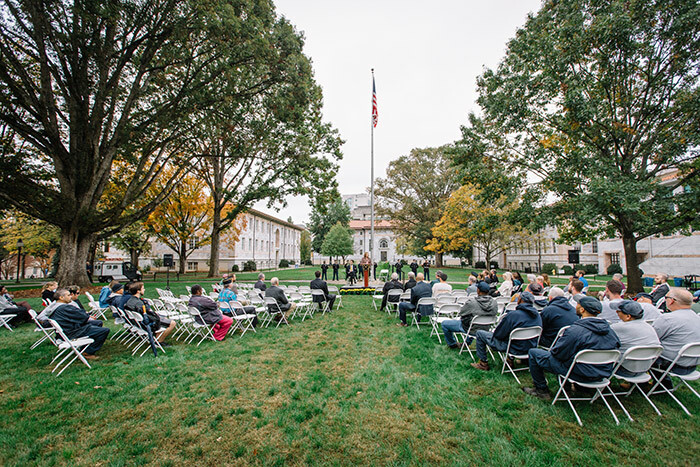 The Emory community gathered on the Quadrangle on Wednesday morning to honor veterans and those currently serving in the U.S. military. 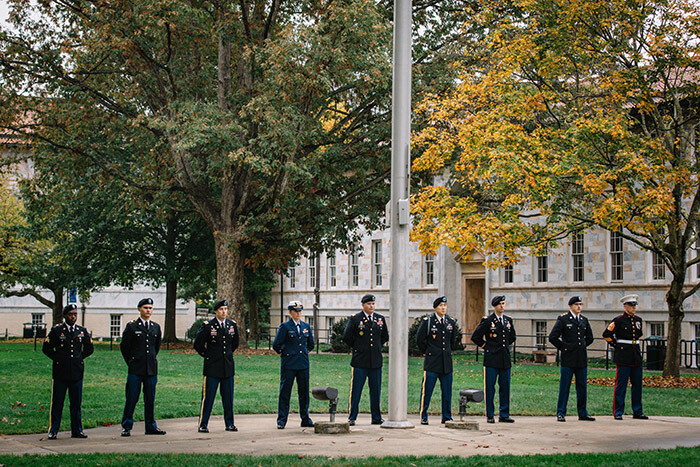 The annual Veteran's Day celebration — held Nov. 8 since the official holiday, Nov. 11, falls on Saturday this year — began with a solemn honor guard procession to the flagpole. Jeff Rosensweig, Goizueta Business School associate professor of finance and founding faculty sponsor for the Emory Veterans Association, welcomed attendees and introduced the ceremony's first speaker: Emory President Claire E. Sterk. As the flag waved against gray, threatening skies, Sterk noted that some people had asked her if the ceremony would still take place due to the weather. "This is about veterans," she responded. "Of course it is going to happen." Luckily, drizzle held off until the end of the ceremony, which focused on the contributions veterans make to both Emory and the country. "It's quite difficult to in words express the gratitude that we feel for you as members of our community, to really give credit to the sacrifices that all of you have made over the course of your life," Sterk said, addressing the veterans in attendance, as well as those currently serving in the military and ROTC students. "For those of us who are civilians, it is not always easy to understand what it means to have taken the journey that all of you have taken," said Sterk, whose husband, Kirk Elifson, a research professor at Emory’s Rollins School of Public Health, is a U.S. Army veteran. She thanked veterans and their families for the sacrifices they have made in order to serve. "For many of you, your time in the military also meant that you had to postpone personal goals because you wanted to participate in this larger mission," she said, adding that she hoped the veterans in the audience would "take a moment and just be really proud" of who they have become. "You are leaders with a sense of purpose; you are thinkers with a sense of duty; you are men and women who know what it means to commit for the long haul, to postpone your personal goals for the common good," she said. 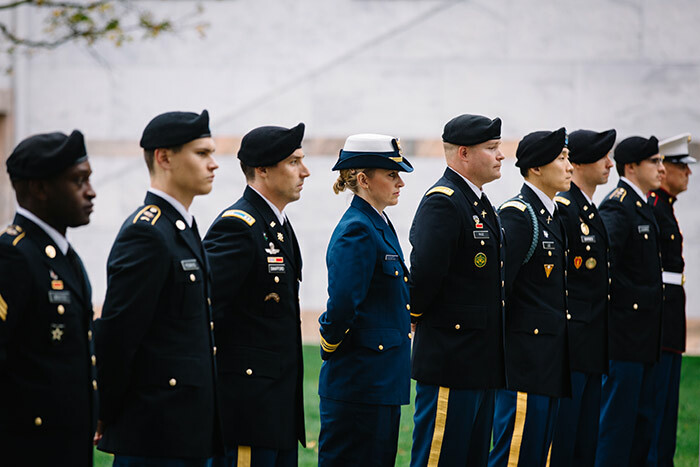 Veterans' education benefits are available through all of the undergraduate and graduate schools that make up Emory University. Through the Yellow Ribbon Program, degree-granting institutions of higher learning in the U.S. voluntarily enter into an agreement with the Veterans Administration to fund tuition expenses that exceed the annual VA tuition and fees benefit. 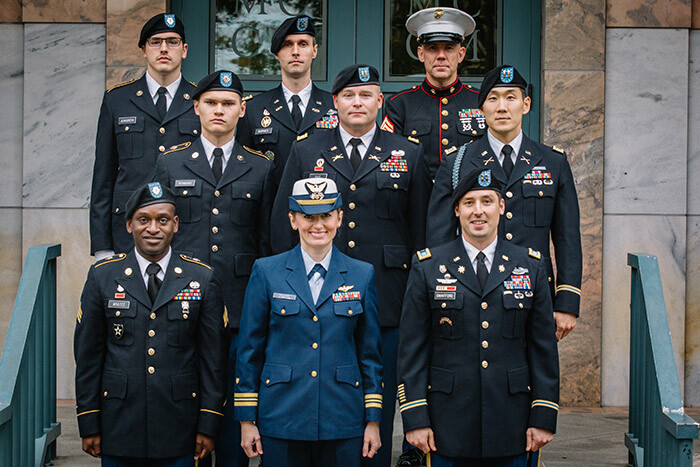 "This year alone, Emory contributed over $1.6 million in education support to veterans across our nine schools and colleges," Sterk noted, adding, "it's just the beginning." 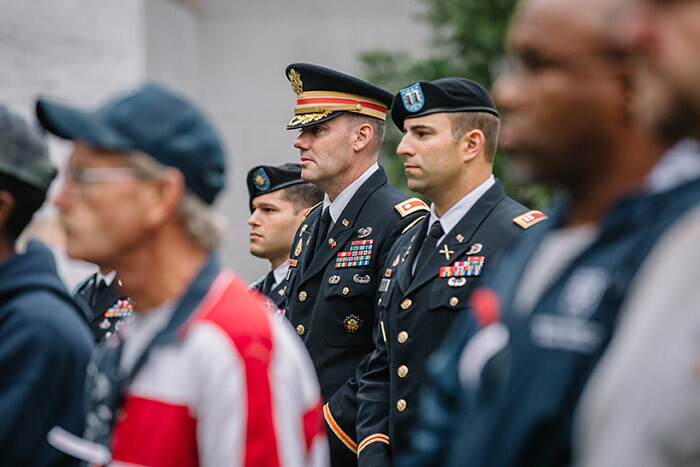 The Emory Law Volunteer Clinic for Veterans provides pro bono legal services for veterans, assisting them and their families with the legal issues that they face, including claims for service-connected disability. "It's a place where people can go to deal with some of the many legal challenges that feel so unfair and so unnecessary," Sterk said. The Emory Healthcare Veterans Program, part of the Warrior Care Network, focuses on the "invisible wounds of war," such as post-traumatic stress disorder, traumatic brain injury, military sexual trauma, anxiety, and depression-related to past military service — "all of that without out-of-pocket costs for the veterans," Sterk noted. "I want Emory to invest in you not only for what you have done, which is a lot, but for what you will do, what you will contribute to all of us for the future," she concluded. 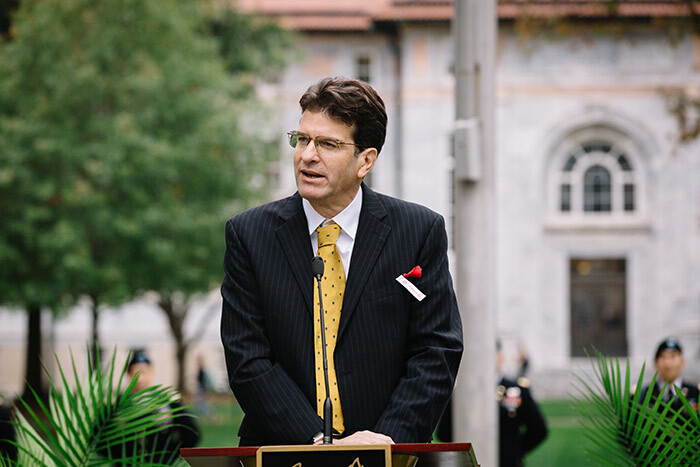 The second speaker for Emory's Veterans Day commemoration was Michael Heekin, who served as a captain in the U.S. Army and as former chief operations officer of WedMD. Taking the stage following Sterk, "I think I'm tempted to say 'what she said' and sit down," Heekin joked. More seriously, "it is especially meaningful because of Emory's heartfelt and sincere commitment to veterans," he said. 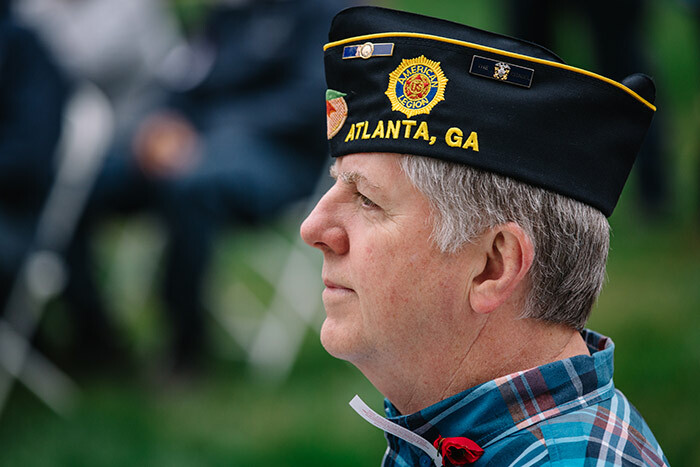 "And it is clear, not only from words but from actions, that Emory values veterans as contributors in a special way to the intellectual richness of the campus community." Veterans' service is not over when they return to civilian life, Heekin noted. "As you continue the transition to life after military service, I hope you will take with you a continuing commitment and readiness to defend our freedoms," he said. "As veterans, that is our responsibility and privilege." Heekin said he is concerned that younger Americans do not have a deep understanding of the ideals on which the country was founded, "how humans with all their weaknesses and flaws risked everything to build something better than themselves." He encouraged veterans to help in two ways: "First, join with others to push for the adoption of a rigorous civics education curriculum in our schools," and second, to "lead by example" through actions like encouraging the reading of the Declaration of Independence and the Bill of Rights on the Fourth of July, Memorial Day and similar gatherings. "So here we are, still on active duty, whether we like it or not," Heekin said. "Fall in." Veterans Day at Emory is sponsored by the Emory Veterans Association, Employee Council and the Office of the President. After the ceremony, attendees enjoyed refreshments provided courtesy of Aftab Ansari, professor of pathology in the School of Medicine, who served as an officer in the Navy and is a Vietnam veteran.